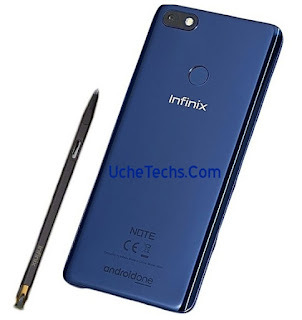 Another Infinix mobility device called Infinix Note 5 Pro is here and the device was released recently. The Smartphone comes with 4GB Ram and Runs on Android 8.1 Oreo. The internal Storage is very shocking guys, keep reading.. The Internal Storage is 64GB while the battery is 4,500mAh battery capacity. Isn't this very nice... Also, the Infinix Note 5 Pro is an Android One Smartphone which features a bigger 6-inches infinity display, featuring 18:9 aspect ratio, and has some AI artificial intelligence built-in. The device is powered by MediaTek Helio P23 MT6763T chipset, designed in full Polycarbonate body, and has a 6.0 inches display. As per the camera, the Note 5 Pro spots a 2MP rear camera with AI auto scenes detection, one LED Flash and 16MP front facing camera.